INEC ’ s National Commissioner and member Information and Voter Education Committee, Madam Mohammed Haruna, disclosed the commission ’ s decision in a statement in Abuja . 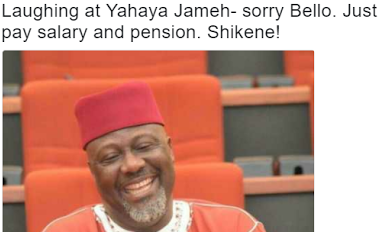 Aggrieved voters from Melaye ’ s constituency were at the commission ’ s headquarters in Abuja on Wednesday where they presented their petition on their demand for the recall of the senator. Haruna said , “ INEC has held its regular weekly meeting today and considered the petition submitted by whole registered voters from Kogi West senatorial district to kickstart the process of recalling Senator Dino Melaye. “ In accordance with the INEC guidelines for the recall of members of the National Assembly, the Commission has finally acknowledged the receipt of the petition to the petitioners representatives and has conveyed a letter notifying Senator Dino Melaye of our receipt of the petition. “ The next step is to verify that the petitioners are registered voters in Kogi West senatorial district. Kogi West , which Melaye represents in the Senate , has seven local governments areas. The breakdown, as shown in the petition is: Yagba West, 55.7percent; Lokoja, 54.8percent; Kogi, 52.77percent; Yagba East, 52 percent; Ijumu (Melaye’s local government ), 51.8 percent; Mopa /Moro, 50.4percent and Kabba/Bunu, 46.7percent. He had said, “ We want Senator Melaye back because of poor representation, he is also not accessible to us, he is unreadable and has no constituency projects.